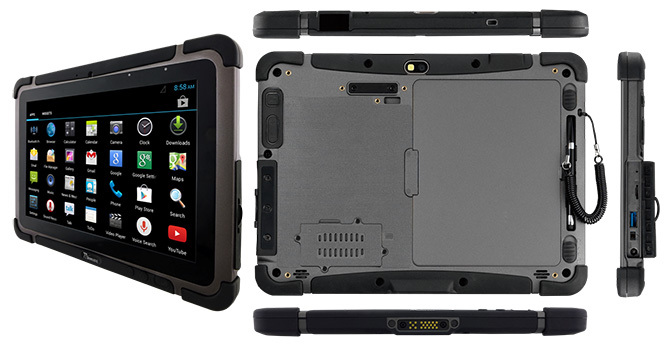 Winmate Communication announced that as of February 2015, their popular thin-and-light M101 rugged tablet computer platform will also be available in an Android version. The Android 4.2-based M101M4 tablet shares the design, dimensions and 10.1-inch display with the initial Microsoft Windows-based M101B, but not the internal electronics which are optimized for Android. Why offer essentially the same product in both a Windows and an Android version? Because unlike in consumer markets where Android and Apple's iOS dominate, Windows remains strong in vertical and industrial tablet markets but those customers are also increasingly interested in evaluating or implementing Android-based solutions. The reason for the M101 platform's positive customer reception is that it successfully merges popular elements of today's consumer media tablets with the ruggedness required to hold up on the job even under trying environmental conditions. The tablet's tough polycarbonate case with its protective rubber overmoldings is undeniably attractive. Its smooth and glossy black glass surface is modern and iPad-esque, and offers the effortless elegance of capacitive multi-touch. How does the Android version differ from the Windows version? Quite a bit, actually. Android is a substantially smaller operating system than full Windows and has significantly lower resource requirements. As a result, the M101M4 runs on a non-specified 1.5GHz ARM Cortex A7 processor rather than the 1.86GHz Intel "Bay Trail" N2920 of the Windows version, there's 1GB of RAM instead of 4GB, and mass storage consists of 16GB of eMMC flash instead of the 64GB mSATA SSD in the Windows machine. That's plenty enough to run Android, and if more storage is needed, there's a microSD card slot. While the M101M4's display is the same 10.1-inch size and uses the same 16:10 wide format as the Windows version, resolution is 1280 x 800 pixel instead of 1920 x 1200. Here again, that's enough for Android which was designed for touch from the ground up and doesn't have all the tiny scrollers and check boxes of legacy Windows. What's also different is I/O. It's all concentrated in one I/O block on the right side of the tablet but while the Windows version has micro HDMI, a full-size USB 3.0 port and a LAN/RS232 combo port, the M101M4 only has a micro USB 2.0 OTG host and client port. Once again, that's because Android works differently. As a newer OS, it has no need for serial communication or wired LAN. For wireless there's dual-band 802.11a/b/g/n WiFi and Bluetooth 3.0. u-Blox Neo-6Q GPS is available as is the Chinese BDS navigation system. Mobile broadband seems to be available also, as well as optional RFID. There are two cameras, a 2mp in the front for conferencing and an 8mp document camera in the rear (the Windows version's documentation camera is only 5mp). Customers may also include an embedded Motorola SE4500 1D/2D barcode reader. The standard Li-Polymer battery, which is hot-swappable, packs 39.2 watt-hours. Thanks to the Android version's lesser power draw it lasts longer, 8-10 hours vs. around 6 in the Windows system. Power users can still opt for the also available extended battery with twice the capacity. As is expected in a next-gen tablet, there's a full complement of sensors. With its impressive case, corner protection, and protective I/O cover, the Winmate M101M4 is a great deal tougher than any consumer tablet. Environmental specs include a wide 14 to 122 degree Fahrenheit operating temperature range (and -4 to 140 degree F when plugged in), four foot drop, and IP65 sealing rating, which means users won't have to shy away from rain. No word yet on pricing. Given the tech specs, it's quite possible that the Android-based M101M4 will cost a good deal less than the Windows version. Stay tuned for word on that.